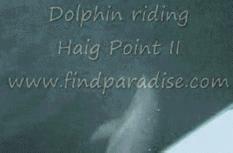 How do you get to Haig Point? 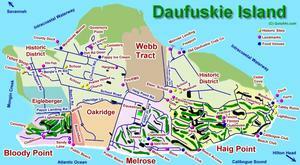 When You Think Haig Point or Daufuskie Island, Think Paradise! Click Here to watch a YouTube Video file of a dolphin riding the bow wave of the Haig Point II ferry from Hilton Head Island to Haig Point. This is an example of the many daily encounters with wildlife and the original beauty of the lowcountry you will find at Haig Point. Just another ordinary day in Paradise! Haig Point is located on beautiful Daufuskie Island on the intracoastal waterway between Savannah Georgia, Tybee Island Georgia and Hilton Head Island SC. There are no cars, no noise and no pollution in this exclusive luxury community. A private ferry takes you to your wonderful vacation or residential home surrounded by the Atlantic Ocean, Calibogue Sound and one of the top 100 rated private golf courses in the United States. Haig Point is private and exclusive. You can only visit as the guest of a member or of a real estate company. Beautiful new homes are being built on 1100 acres of eco-friendly property. You can purchase a lot and home package, an existing home or just a lot with membership. Owners can rent rooms in the Strachan Mansion, the 1873 Haig Point lighthouse or in private homes located within the resort. 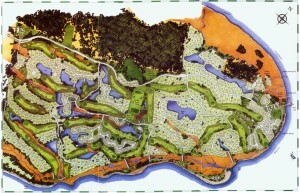 The world-class amenities include the 29 hole Rees Jones Signature golf course, club house, tennis center, state of the art fitness center, ocean-front heated pool at the beach club, the Strachan Mansion, the lighthouse, the equestrian center, community dock, and all the wonderful attractions of nearby Hilton Head Island! And of course, we have all the concierge, grounds keeping and other services befitting a lifestyle of quiet luxury and discerning taste. Click Here to sign up for our next home tour. It's a beautiful and fun afternoon experience! Email auctions@findparadise.com to sign up for our Haig Point, Daufuskie Island and Hilton Head Island auction notification list. We'll let you know anytime anyone is running an auction for real estate properties in the area. Information provided on this website is deemed reliable, but not guaranteed. Please verify items of importance to you.